Rising more than 7000 feet above Jackson Hole, the high peaks of Grand Teton National Park provide one of the most dramatic landscapes in the world. Although many people seem to treat it as an afterthought, only visiting the park as a side trip while visiting its more famous neighbor to the north, more time and focus should be given to this stunning landscape. Within its 310,000 acres the majestic mountains of the Teton Range are home to a wide variety of wildlife, eight peaks that top out above 12,000 feet, more than 100 alpine and backcountry lakes, and more than 200 miles of trails that provide intimate access to all of this incredibly beautiful scenery. 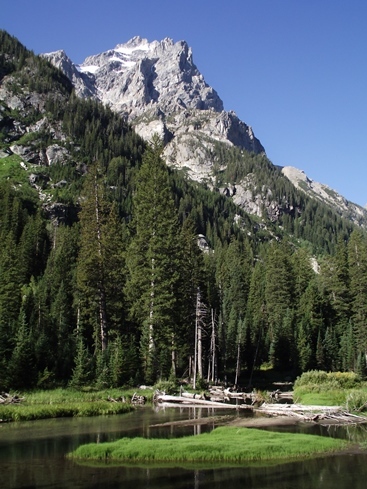 The Cascade Canyon Trail is widely touted as one of the best hikes in the entire National Park System. In addition to the stunning views of 12,928-foot Mt. Owen, the trail visits Hidden Falls and Inspiration Point. 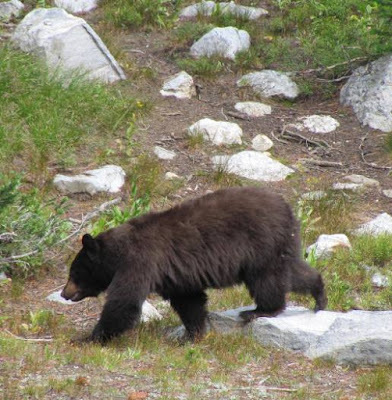 The route is also known for the wide variety of wildlife that is frequently seen, especially bears and moose. 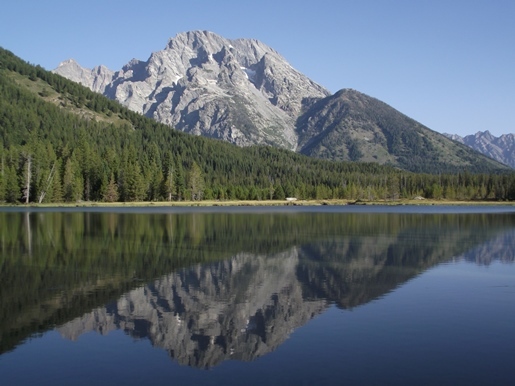 Lying along the eastern base of the Teton Range is a series of glacially-carved lakes. Rising sharply above their western shores, the views of the rugged mountains are stunning and dramatic. From the shores of Jackson, Leigh, Jenny, Phelps, Bradley and Taggart Lakes, hikers will enjoy some of the most striking views in the park. Although Yellowstone rightfully receives a lot of attention for its wildlife viewing opportunities, the Grand Tetons are also known for its diversity of wildlife. The rugged mountains provide habitat to a wide variety of wildlife, including black bears, grizzly bears, elk, bison, bighorn sheep, moose, pronghorn, wolves, fox, lynx, bobcats and mountain lions. There are also more than 300 species of birds, including trumpeter swans, ospreys and bald eagles. A drive along Moose-Wilson Road is a popular way of spotting mega fauna such as bears and moose. However, hikes such as Amphitheater Lake, Hermitage Point, Moose Ponds and the Emma Matilda Lake Loop are all great choices for possibly seeing wildlife in the backcountry. The abrupt rise of the Tetons from the valley floor arguably makes them one of the most photogenic mountain ranges in the world. As a result, professional and amateur photographers alike will enjoy a multitude of photo opportunities around the park. 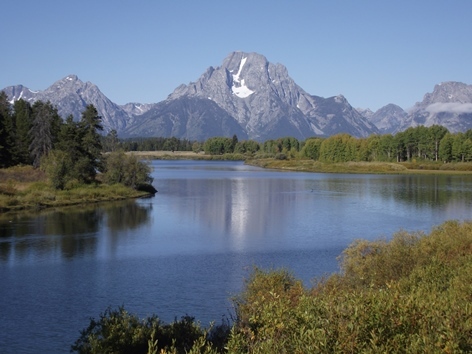 Some of the best spots for getting that perfect shot include Mormon Row, Oxbow Bend, Schwabacher’s Landing, as well as the Snake River Overlook, which was made famous by Ansel Adams' 1942 photograph. Of course all of the backcountry locations mentioned above will also provide outstanding photo opportunities. 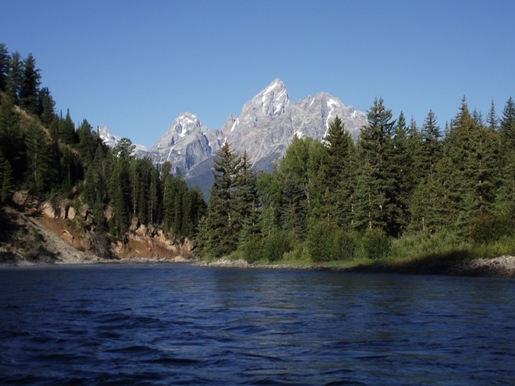 The Snake River meanders along the sage brush flats below the Teton Range, and provides park visitors with the unique opportunity of enjoying the majestic mountain scenery from a raft. Although outfitters offer trips throughout the day, I highly recommend the morning trips, as the mountains typically look their finest when bathed in the glow of early morning sunshine. Morning is also the best time to view wildlife along the river banks, including bald eagles. More than 305 million people visited national parks in 2015, eclipsing the all-time visitation record that the National Park Service saw in the previous year. The unofficial visitation numbers for 2015 were announced by National Park Service Director Jonathan B. Jarvis, as the National Park Service (NPS) is celebrating its centennial year. "The increasing popularity of our national parks comes as we are actively reaching out to new audiences and inviting them to explore the depth and breadth of the national park system," Jarvis said. "The 409 parks we care for preserve natural, cultural and historic landscapes across 84 million acres in all 50 states, the District of Columbia and U.S. Territories, and they tell stories that reflect the great diversity of our nation." Record visitation tests the capacity of the park system and challenges parks to continue to provide great experiences for all visitors. Jarvis said park managers are adjusting to make sure they have sufficient staff to provide interpretive programs, answer visitor questions, respond to emergencies and to keep restrooms, campgrounds and other facilities clean. Park visitors can plan their trips to avoid peak crowds by visiting the most popular parks in spring and fall and by visiting early in the morning or later in the day. Visitors can also take advantage of shuttles and walking trails at some parks, including the Great Smoky Mountains, Glacier, Rocky Mountain and Grand Teton national parks. "Even with record breaking visitation, visitors can still find quiet places in the parks for those willing to seek them out," Jarvis said. "I can take you to Yosemite Valley on the Fourth of July and within five minutes get you to a place where you are all alone." Much of the increase in national park visitation is the result of the National Park Foundation's "Find Your Park" media campaign. The campaign has sparked interest from travelers and also from communities near national parks, state tourism agencies and Congress. In late December 2015, Congress approved a nine percent funding increase for the National Park Service, which will help the agency continue to provide excellent visitor services as visitation increases. "The increase in Congressional appropriations comes at a critical time for the National Park Service and will help us to serve the growing number of visitors,"Jarvis said. "We look forward to continuing to work with Congress as it considers additional legislation in support of the National Park Service Centennial, which would further improve the national parks by encouraging philanthropy and volunteerism, while also allowing us to improve visitor services and connect with a new generation of national park visitors." By the Numbers: Unofficially, the NPS recorded more than 305 million visits during 2015. That is an increase of more than 12 million visits, and more than four percent, over the 2014 figure of 292.8 million visits. About 365 of 409 parks in the national park system record visitation numbers. The NPS has recorded more than 13 billion visits to parks since park managers began counting visitors in 1904, some 12 years before the NPS was created. Official statistics including the most-visited parks of the national park system and the most-visited national parks will be released in late February. Thru-hiker and videographer, Gator Miller, does an excellent job of showing what life is like as a thru-hiker on the Appalachian Trail in the Great Smoky Mountains National Park. As the name of his video implies, "Never Underestimate the Smokies," the park can present a variety of challenges - from deep snow, fog and rain, to periods of boredom (his encounter with a deer). When the weather's good, however, the 71-mile section of the Appalachian Trail in the Smokies is quite spectacular. With more than 800 miles of trails meandering throughout the park, hiking is the absolute best way to see the Great Smoky Mountains National Park. In addition to the Appalachian Trail, the park offers many other outstanding hikes. If you do plan to visit the Smokies this year, please note that our hiking website also offers a wide variety of accommodation listings to help with all your vacation planning. 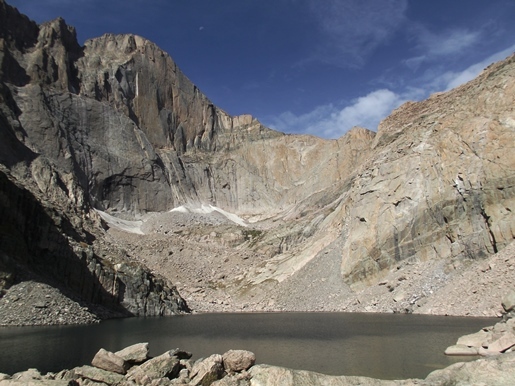 With more than 350 miles of trails meandering throughout the park, and a wide variety of outstanding hikes, Rocky Mountain National Park is definitely a hikers paradise. If you do plan to visit Rocky Mountain this year, please note that our hiking website also offers a wide variety of accommodation listings and other things to do to help with all your vacation planning. In celebration of the National Park Service Centennial, Superintendent Cassius Cash has committed to hike 100 miles in Great Smoky Mountains National Park during 2016 and is challenging the public to do the same. The 100-mile goal is part of the “Smokies Centennial Challenge-Hike 100” program. This program aims to inspire all potential hikers—young and old, new and skilled—to experience and gain a new appreciation and stewardship for their national park. “I invite people of all ages and backgrounds, including millennials, to join me on this journey as we discover and explore the Smokies,” said Superintendent Cassius Cash. “The Hike 100 challenge allows me to have a personal role in ensuring that the next generation of park users, supporters, and advocates carries on the legacy of the National Park Service for the next 100 years. The lifeline of any legacy is to ensure that our voices are not only heard by the next generation, but also shared in a manner that inspires them to pick up the torch from the previous generation and carry it forward." 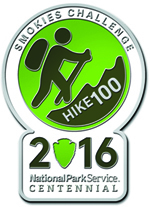 To complete the Hike 100 challenge, participants must hike any 100 miles of maintained trail within the park boundaries between January 1 and December 6, 2016. These miles can include everything from the front country nature trails to the extensive backcountry network of trails. Participants can choose to hike the same trail repeatedly or choose to hike many different trails to accumulate a total of 100 miles. Participants who reach the 100-mile goal will earn a commemorative “Smokies Centennial Challenge - Hike 100” pin and be invited to a park celebration hosted by Superintendent Cash. The Superintendent is also providing a unique opportunity for the general public to hike alongside him on his way to reaching the 100-mile goal through a series of four hikes open to the public. Two front country hikes in August and December will be completely open to the public, while two backcountry hikes in June and October will be limited to 20 people each. Information about the dates, trails, and how to sign up for one of these public hikes is provided on the park website on the Hike 100 page. In addition to information about the public hikes, the Hike 100 page on the park website provides opportunities for the Superintendent and hikers to share their experiences and reflections about their journeys towards their 100 miles, and a hiking log that participants can use to track their miles. You can visit the park website for additional information. For a comprehensive list of trails in the Great Smoky Mountains, please visit HikingintheSmokys.com. If you do plan to visit the Smokies this year, please note that our hiking website also offers a wide variety of accommodation listings to help with all your vacation planning. To once again paraphrase Mark Twain, "the reports of the death of backpacking in the Smokies have been greatly exaggerated". According to data collected by the National Park Service Visitor Use Statistics website, the number of backcountry overnight stays in the Smokies jumped by more than 13% in 2015, when compared to the prior year. 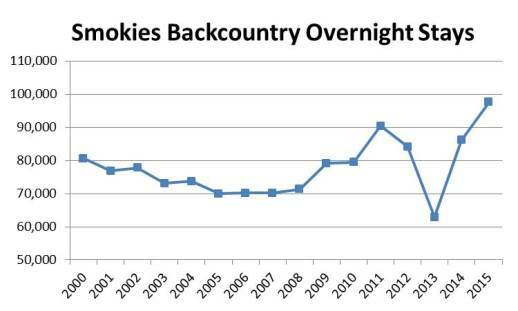 Moreover, the 97,629 backcountry overnight stays recorded in last year was the highest count in the last 16 years. Some people in the backpacking community thought that the sharp drop-off recorded in 2013 was a direct result of the backcountry fees that were implemented in February of that year. Although that may be true, that some backpackers were essentially boycotting the park in protest to the fees, that trend appears to have been reversed. 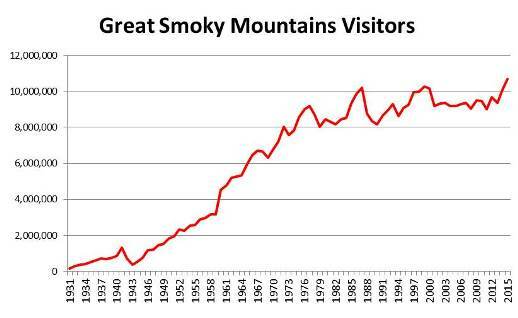 According to data collected by the National Park Service Visitor Use Statistics website, visitation to Great Smoky Mountains National Park increased by a whopping 6% in 2015, when compared to the prior year. In total, the park recorded 10,700,844 visitors last year, versus 10,099,275 in 2014. Moreover, 2015 now ranks as the highest visitation count on record, and is only the fifth time visitation has ever exceeded the 10 million mark. 1999 now ranks as the second highest when 10,283,598 people visited the park. The 2015 number is almost 4.1% higher than the visitor count recorded in 1999. If you plan to visit the Smokies this upcoming year, please note that our hiking website also offers a wide variety of accommodation listings to help with your trip planning. 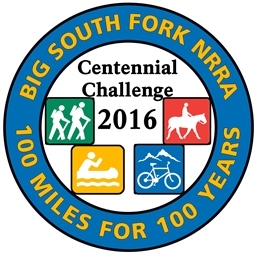 In celebration of the 100th birthday of America's national parks, Big South Fork National River and Recreation Area is sponsoring "Centennial Challenge: 100 Miles for 100 Years". From January 1 through December 2, participants will have a great opportunity to get out and experience many of the unique cultural and natural features of this park along their 100-mile journeys. This is a self-paced activity for visitors to hike, ride (mountain bike or equestrian), and/or paddle along the park's 500-mile multi-system trails including 70+ miles of the Big South Fork river and its tributaries. All finishers are eligible to receive a patch that was specially-designed for this event. Please visit the park's website to download the Centennial Challenge log sheet. The honor system applies; as you accumulate miles, record them. When completed, bring the log sheet to the Bandy Creek Visitor Center or mail to: Big South Fork National River and Recreation Area, 4564 Leatherwood Ford Rd. Oneida, TN 37841 or email us via the park website. There will be a culminating Centennial Challenge celebration program at the Bandy Creek Visitor Center on December 3, 2016. At this event park rangers will recognize both the youngest and oldest males and females who completed 100 miles along with the participant(s) who accomplished the challenge incorporating the most categories (hike, ride, etc.). All participants who completed the challenge will also have the opportunity to participate in a group photo at the event. Participants are also highly encouraged to photograph their favorite places and memories along their journeys. Selected submitted images of participants' journeys may be printed for exhibition at the Visitor Center and may be displayed on the park's website and other venues. Join the park in their year-long centennial celebration as they strive to connect with and create the next generation of park visitors, supporters, and advocates for our national parks. For more information on how you can be involved, please call the Bandy Creek Visitor Center at (423) 286-7275. With more than 200 miles of trails meandering throughout the park, hiking is the absolute best way to see Grand Teton National Park. The park offers a wide variety of outstanding hikes. If you do plan to visit Grand Teton this year, please note that our hiking website also offers a wide variety of accommodation listings and other things to do to help with all your vacation planning. As America ring's in the new year today, 2016 marks a major milestone in the history of this country. Almost 100 years ago the National Park Service was created. On August 25, 1916, Congress passed the National Park Service Organic Act, which established the NPS to "promote and regulate the use of the Federal areas known as national parks, monuments, and reservations .... which purpose is to conserve the scenery and the natural and historic objects and the wild life therein and to provide for the enjoyment of the same in such manner and by such means as will leave them unimpaired for the enjoyment of future generations." National Park Centennial celebrations will be held throughout the year, beginning with today's Tournament of Roses Parade. The theme for today's parade is “Find Your Adventure”. The Centennial will celebrate the achievements of the past 100 years, but it is really about the future. It’s about kicking off a second century of stewardship for America’s national parks and for communities across the nation.